Some years ago I embarked on the odyssey of reading a biography of every U.S. president. After watching a program on the American Revolution I was intrigued by the story of Benedict Arnold and got a book out of the library on his life. That led me to read a biography of George Washington. And I was hooked. Reading biographies teaches me much about history, but also about living and working in the world. I just finished Andrew Johnson, by Hans L. Trefousse, a well-written and readable biography of one of lowest ranked presidents. Andrew Johnson is famous for being the Vice President left with the daunting task of picking up the pieces after the assassination of Abraham Lincoln and for being the first U.S. President to be impeached. While no one could have effectively followed Lincoln, one of our greatest presidents, Johnson did a really poor job of it. He deserves his low rank among our presidents because he squandered the opportunity to integrate ex-slaves into the nation. Instead he entrenched the racism that would yield the Jim Crow south that would reign until the Civil Rights era. Still, I learned a lot from reading about his life, and I do think of him more highly than some of the other presidents whose biographies I have read. I actually found much to admire about Johnson. One of the oddities of presidential history is that some great men have been mediocre, or even bad, presidents. It all depends on what they face, and how they face it. Johnson was a natural leader and an effective politician. He rose from poverty, not exactly to riches, but certainly to prominence, being first a renown tailor in Greeneville, Tennessee. He quickly moved into local political leadership and then served 10 years in Congress. He was elected Governor and then Senator. Through it all he consistently pursued economic responsibility and championed the cause of the farmer and tradesman, his people. Even at the federal level he stuck to that program even when he had much to gain by “compromising”. This won him the support of the people, something he always believed he retained, but also made enemies of many of his fellow Congressmen and Senators. 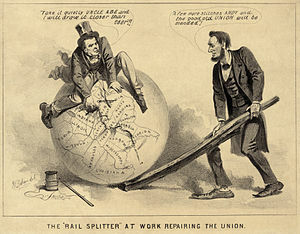 Johnson became Lincoln’s second Vice-President because of his stalwart support of the Union even as the south seceded and the war began. He refused to go along with the South not because he was against slavery, for he was not, but because he believed the challenges the country faced could be solved by working within the Constitution. He was willing to defy most of his own state, at great personal danger, in this belief. Lincoln noticed and first installed him as Military Governor of Tennessee, and then made him his running mate for his second term. Not long after the election, and the Confederate surrender at Appomattox, Lincoln was assassinated and Johnson became President. I have never really thought much about the challenges the country faced after the Civil War ended. What do you do after half the country has rebelled and then lost? How do you rebuild? What do you do with the rebel leaders? These are the difficult questions of Reconstruction. One of the great “what-if’s” of history is what if Lincoln had not been killed? What would he have done to rebuild the nation? No one really knows. But Johnson believed he knew. And he did it no matter what anyone else, even Congress thought. Next time we’ll look at the lessons I learned from Johnson, from this bottom-of-the-barrel President. This entry was posted in Books and tagged Andrew Johnson, Biography, Hans L. Trefousse, U.S. History, U.S. Presidents on November 14, 2013 by revkamcclain.